GREAT VALUE!! 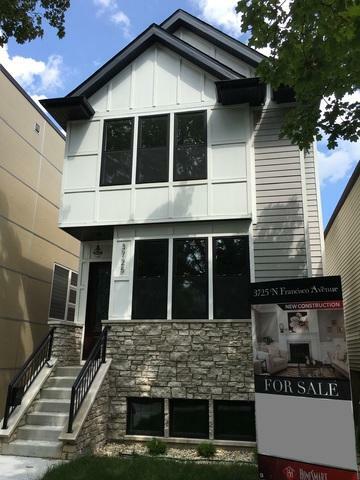 !New construction single family house with a roof top deck on the garage, situated on a quiet tree-lined street. Irving Park neighborhood, walking distance to Addison Blue Line. Modern kitchen with shaker cabinetry quartz counter tops, high end Thermador appliances and big island. Living/dining room with gas fireplace. Master suite with double closets, bathroom with heated floor, freestanding soaking tub, separate shower and double vanity. 2 additional bedrooms, full bath with double vanity and tub, and conveniently located laundry room complete the upper level. Lower level offers large rec room with soft carpeting; wet bar; full bathroom; second laundry hook up and fourth bedroom. 2 HV/AC systems, wired for sound, hardwood floors; concrete patio, fenced in backyard; 2 car garage and a roof top deck.